This amazing website produced by Focus Features includes links to movie resources, articles, think pieces, and much more. This entry was posted in Featured Resource, Metasite on April 26, 2008 by Nancy. Films held in the Columbia Libraries are primarily VHS, Laserdisc and DVD formats. A useful search for browsing is subject heading search. You can browse a listing of all of our feature films, documentary films, foreign language films. This entry was posted in How to... on April 25, 2008 by Nancy. Distributed by PBS Thirteen/WNET New York. In four separate episodes, this documentary provides a comprehensive look at race relations in America between the Civil War and the Civil Rights Movement. It documents the context in which the laws of segregation known as the “Jim Crow” system originated and developed. 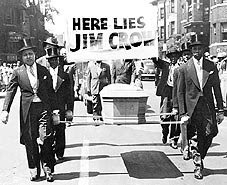 “The Rise and Fall of Jim Crow.” By: Cassanello, Robert. American Historical Review, 2003, Vol. 108 Issue 2, p623-624. This entry was posted in Featured DVD of the Week on April 25, 2008 by Nancy. We still buy print resources related to Film Studies. Take a look at the Motion Pictures, Cinema, Film Guide for a listing of print resources. Please note this guide is in the process of being updated and revised. This entry was posted in subject guide on April 25, 2008 by Nancy. An excellent start for locating journal and magazine articles is to use an index or bibliography. Columbia University Libraries subscribe to hundreds of journal indexes that are available online. There are several that concentrate on indexing all of the major publications in the area of film studies. Link to the Film and Television Guide for a selected list. FIAF and Film and Television Literature Index are the best for completing a comprehensive search of the major journals in film studies. Depending on your topic, you may also search indexes that cover major disciplines such as American history, philosophy, religion, anthropology, etc. To begin, use CLIO our online catalog. You can search by title, author, subject or keyword. If you know the title or author, this is the most direct method for identifying if we have the book in our collections. You can search for works on films, genres, history, theory, criticism, directors, producers, and actors. There are two best methods for searching by topic or subject–keyword and searching by subject heading. Keyword is a powerful search. Use this to combine multiple topics that you think best describe what you are looking for. Read through “Search Tips” located at the bottom of the CLIO screen for the most effective keyword searches. This keyword search will look for the terms cinema and attractions anywhere in the bibliographic record. Another useful strategy for searching by topic or subject is to use the Library of Congress Subject Headings. This controlled vocabulary needs getting used to but can be very helpful for finding the most works on your topic. You should know that the recognized subject heading for films is motion pictures. Try entering motion pictures and select subject headings for your search term. Take a look at the long list of entries and subdivisions. For materials not held at Columbia, you can request books through Interlibrary Loan or BorrowDirect. If you are just getting started with your research, take a look at the Theatre and Dance Subject Guide for recommendations on selected electronic resources in all aspects of film and television studies. This entry was posted in dance, subject guide, theatre on April 24, 2008 by Nancy. If you are just getting started with your research, take a look at the Film and Television Subject Guide for recommendations on selected electronic resources in all aspects of film and television studies. This entry was posted in film, subject guide, television on April 24, 2008 by Nancy.